Home / France / #GiletsJaunes: #Paris is ours! 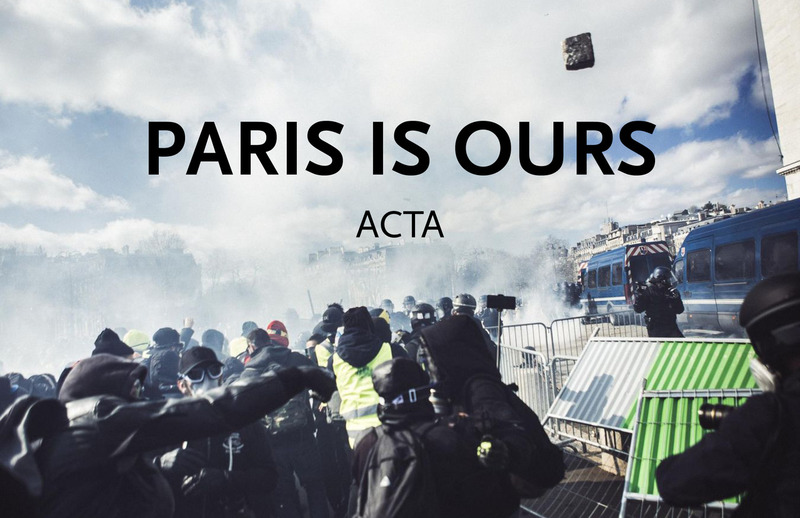 Originally published in French on the ACTA site. English version first published by ill will. Translated by Inhabit. France. Fascist process at work as army want to take control of social protests, threatening openly to kill protesters. Yes, order managed to contain most of the disorder on and around the Champs – despite some more or less successful attempts at wild breakaways. Act XVIII gained in intensity what it lost in geographical extension. But, it was enough to hear the Yellow Vests chanting “revolution!” all afternoon. It was enough to see the crowd pull down the huge metal plaque that protected the Bulgari shop, carry it forward, and charge the police – bellowing “We won! We won!”. It was enough to see the banners come within a few meters of the Arc de Triomphe, the enemy retreat and flee behind the Louis Vuitton before our onslaught. In short, it was enough to be there to understand. Despite the obvious imbalance of power, there was mad determination, rampant trust: people were no longer afraid. What matters in a riot is not the quantity of material damage, the number of broken windows, thrown stones or burned cars. No, what matters is qualitative. It’s the collective energy deployed, and how this deployment transforms consciences. It’s not the statistical losses inflicted on the enemy that count. It’s the political and ideological forces liberated among the people. The media and government, who obsess over the “1500 ultra-violent” who allegedly organized the violence, hide the truth. On March 16th, everyone on and around the Champs participated in one way or another in the riot. This is what horrifies the government: it’s impossible to divide those swept up in the event. What horror, to see peaceful moms and dads smiling for photos on the velvet sofas of Fouquet’s aflame behind them. Castaner encouraged them time and again to dissociate from the “vandals”. But all that talk is vain, inaudible. The arrogance of the government and the brutality of its police have reached such heights that there is no room for dissociation. This is further proof that popular uprisings shake up those who take part in them. They develop their convictions and certainties through contact with practice. Today, principled pacifism has almost disappeared from the Yellow Vests’ marches. Naïvety about state repression, too, has waned. Remember those who, not long ago, pretended to be able to put Yellow Vests in this or that box? To assign one or another intrinsic ideological identity? That the movement again reached such a level of conflict after 18 weeks is already a remarkable fact. But the ultimatum of March 16 was not meant to be a last swan song, however flamboyant. Nothing could be more dangerous than satisfaction with Saturday. It only makes sense as a springboard. It’s a matter of using this date to launch a new phase, to build a spring of struggle. The strong parallel mobilizations for the climate and against police violence raised the burning question of coagulation. Because the riot, even if repeated, is insufficient. It must be linked to a revival of economic blockades and to the continuing work of political and strategic clarification. Éric Drouet recognized this on Saturday evening: the supervised walks were useless. Only overriding imposed frameworks and widespread sabotage of the economy can lead the movement to victory. We have no choice: the first fruits of repressive response suggest what crushing the current movement will mean for everyone.